Following a busy calendar of Grand Prix rounds, the Hitachi KTM Fuelled By Milwaukee Team of Conrad Mewse and Bas Vaessen headed to Lyng for Round Two of the Maxxis British ACU Motocross Championship, held at the East Anglian Cadders Hill Motocross Track. Although joint on points, Vaessen went into the weekend looking to defend his red plate from his teammate. However, Mewse had his own ideas and put on a masterclass for the rest of the field in the first moto. 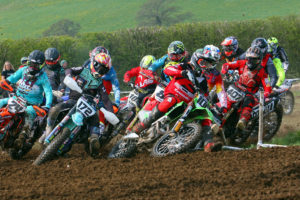 Despite Buildbase Honda MX Racing’s Josh Gilbert taking the holeshot and laying down some impressive times early on, the Shepton Mallet rider found his rhythm and made his way clear of the field to take a convincing win. Under pressure in the second half of the race, Bas Vaessen finished fourth, missing out on the podium to Revo Huqvarna rider Alvin Ostlund. The second Moto of the day kept the local crowd enthralled from gate drop to the chequered flag. Ostlund’s teammate Dylan Walsh took to the front early, acting as the locomotive leading the freight train of Ostlund, Gilbert, Mewse and Vaessen through the opening half of the race. Despite the rough track surface, Mewse systematically picked off those ahead of him one by one, before passing Walsh for the lead on the back section of the circuit. Aided by the dog fight behind him, number 426 managed to pull a slight gap and lead the race to the chequered flag. Vaessen had a much tougher race, battling it out with the remainder of train who were never anymore than a second apart, finishing on the podium just half a second behind second place Walsh. Double Lyng Podium for Buildbase Honda! Burton battles it out for Geartec Husqvarna in Maxxis opener!